SkinCeuticals Body Tightening Concentrate is one of the better cellulite creams I have tried. It dries extremely fast, has virtually no scent, and is easy to apply. It improved the overall appearance of my skin making it look more moisturized, plumped up, and evened out. SkinCeuticals is a great product, but don’t expect it to be miraculous. Although my skin improved, my cellulite was not completely gone or anything. The only downside of this product is that it’s very EXPENSIVE. Luckily, SkinCeuticals offers a money-back guarantee, so that definitely makes the hefty price tag a little less intimidating. So overall, if you’ve got the money, this is a very good option for reducing the appearance of cellulite! 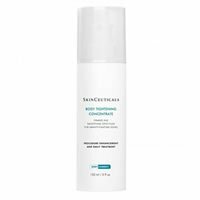 SkinCeuticals Body Tightening Concentrate is a slick white lotion. It feels like a mixture between a gel and lotion. This product is easy to apply because it comes out of a pump. That’s my favorite because it’s easy to use, conserves the product, and is very clean! SkinCeuticals spreads easily and evenly and doesn’t take too much effort to “rub in”. SkinCeuticals Body Tightening Concentrate dries incredibly fast. I would definitely say it dries in less than 3 minutes, which is great! 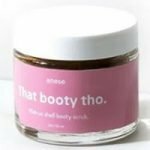 This cellulite cream has a scent that’s difficult to explain. It’s barely there so you can almost call it an odorless lotion. But even though it claims to be odorless, it does have a light smell. It’s very light and faint with a tiny hint of citrus. The smell of SkinCeuticals Body Tightening Concentrate on the skin is actually a little better than in the bottle. I like that the light smell pretty much goes away completely after applying it to the skin. Immediately after applying this product, my skin looked and felt softer. The immediate results were not dramatic, but my skin felt awesome because there’s no greasy or sticky feeling with this lotion. I did occasionally have a tingly sensation after applying SkinCeuticals. It isn’t a painful or intense feeling; but rather it’s a nice refreshing sensation. After a few weeks, I noticed skin looking and feeling softer and smoother. It also looked healthier and more even. My cellulite was still visible, but definitely less noticeable. Finally, my skin did feel tighter and plumper after using this product. This lotion has 31 ingredients. SkinCeuticals emphasizes three key ingredients: tripeptide, yeast extract, and hydrolyzed rice protein. They claim tripeptide helps moisturize the skin making it plump up and support the skin’s natural structure. Yeast extract supposedly helps re-inflate the skin while the hydrolyzed rice protein is included to firm and tighten. One bottle of SkinCeuticals Body Tightening Concentrate costs $78.00. At a bottle size of 5 oz, that works out to about $15.60 per ounce. Needless to say, that’s VERY expensive. SkinCeuticals offers a 90-day money back guarantee, which is very generous compared to virtually all other cellulite creams on the market. I love seeing this type of guarantee, especially on such expensive products. To buy SkinCeuticals Body Tightening Concentrate, click here.